As the table saw is the most common large power tool in many home DIY workshops across the globe, it’s no wonder that making or purchasing accessories for them is such a popular pastime. Table saws make rip and crosscuts with ease and precision; they can also make accurate rabbets and dados with the right blade(s). 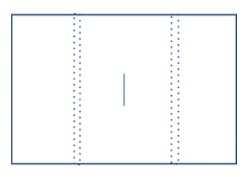 However, the standard footprint of a typical contractor’s saw is only about 27 x 40” (65 x 100 cm). The graphic on the right depicts this; the blade is in the middle and the dashed lines represent the miter gauge slots. This relatively small footprint is fine for handling cuts of all types for smaller pieces of stock; however, cuts on longer and larger pieces of wood or sheet goods like plywood are difficult if not actually dangerous on the typical table saw top. Fortunately, several simple additions to the table saw can not only allow the solo DIY make these cuts easily and accurately, but they can also do so safely. A previous article focused on the fabrication of an outfeed table— this table supports stock once it’s passed over the blade and makes handling wider stock much safer (the red dashed line in the graphic on the right). This article will focus on another support table, a side table to the right of your table saw. This table, combined with the outfeed table shown, takes the performance of your table saw to an entirely new level. There is virtually no cut on a table saw that a home DIY’er can’t handle on their own with these two additions in place. The dimensions of the side table here aren’t meant to be etched in stone, these numbers aren’t on the back of the two tablets Moses brought down with him. Instead, the dimensions are meant to provide guidance; the space considerations of each and every workshop will dictate what dimensions can be incorporated into these tables. The material(s) of choice for this side table are: plywood for the top and either construction grade lumber for the legs, or, if you have it, 2 x 2” (5 x 5 cm or larger) hardwood stock. Plywood for the top is the obvious and easiest choice; since plywood doesn’t swell, twist or warp with changes in temperature and humidity, it makes an excellent substrate for the top where flatness and consistency are a priority for maintaining accuracy and precision for your cuts. While the selection of construction grade lumber or hardwood stock for the support legs is based on what you have lying around—either support mechanism will probably need some self-leveling knobs for the bottom to ensure that your table is dead flat, even if your shop floor isn’t. These items are easily obtained for very little cost. The home DIY’er has two choices when it comes to dimensions for this side table. If they have already created an outfeed table, then they will probably choose a design that looks like the one on the left below. If they haven’t, they may choose the design on the right. The width of a typical outfeed table is about 24” (60 cm); this dimension is easily obtained at many home centers in lengths from 24–96” (60–240 cm) which eases the need of the solo DIY type to cut larger pieces of plywood. Either choice provides a virtual landing runway for larger goods to safely be cut. 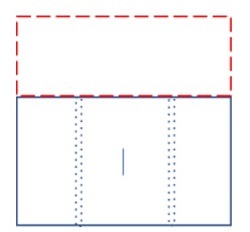 Nominal dimensions for the plywood sheet cut for the design on the left are 30 x 50” (75 x 125 cm) while the one on the right are approximately 30 x 27” (or the depth of your table saw; 75 x 65 cm). Attaching and leveling the panel to the saw is a pretty straightforward task, the sides of the saw provide something for the panel to register against and the legs, cut to the height of your table saw minus the depth of the plywood and the leveling foot, can be easily adjusted so the panel sits perfectly flat. The utility of these leveling feet cannot be understated—for the design on the left, you’ll probably need four legs while the design on the right might only need two legs. Regardless of the number of easily fabricated and attached legs, the leveling feet ensure a perfectly level side table allowing the DIY homeowner to safely and accurately cut even large sheet goods as well as expand the utility and function of the most versatile tool in the home DIY shop.